Sandstone Cottage Stone Walling supplied by J.H. Wagner & Sons. Cottage Stone provides an early settlement appearance for feature walls or houses. The stones are supplied in height combinations which will be used together in one course. For example a 290mm high stone of 90mm and a stone of 190mm with a 10mm joint between these two stones, thus equalling the height of the 290mm high stone. 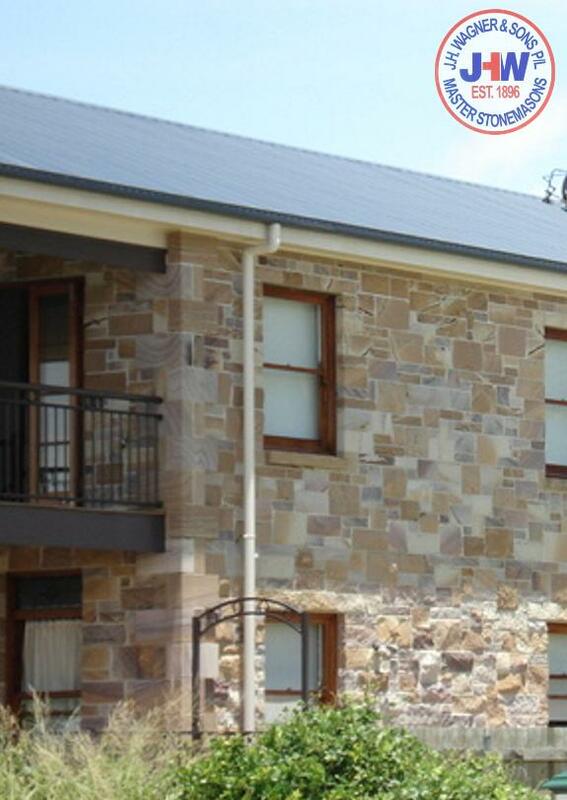 Cottage Stone is natural Helidon Sandstone which has been split on the front and back faces and both ends. The tops and bottoms of these stones are diamond sawn which enables the stones to be installed in set courses. Cottage Stone is approximately 100mm thick and the pieces are supplied in random lengths. Sawn back material for cladding can also be supplied by order. Mixed colour sandstone or select colour Brown, Pink or White are available for Cottage Stone Walling.